Born in Australia, raised in England, now an American citizen, Rupert Murdoch is the founder of News Corporation, named for his first newspaper, Australia's Adelaide News. With subsequent expansion to Europe and America, Murdoch's News Corp is the parent company of an interlocking media empire that includes television, movies, cable networks, book publishing, satellite TV, magazines and newspapers operating in the United States, Australia, Europe, Latin America, Asia and the Pacific Basin. Beyond his hundreds of newspapers, Murdoch's best known brands include 20th Century Fox, Fox Television, DirecTV, Harper Collins, and MySpace. His father, Keith Murdoch, had been an old-fashioned journalist who started as a political correspondent for Australia's Melbourne Age newspaper, and delivered reports on Gallipoli that famously exposed scandal on the battle front. 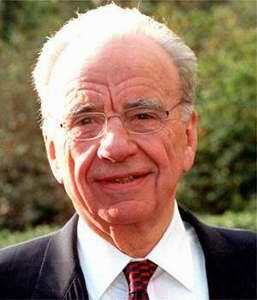 The elder Murdoch co-founded the Australian Journalists Association, became editor of the Sydney Morning Herald, was knighted in 1933, and later managed Australia's Herald & Weekly Times newspaper group. Murdoch and his father were distant and often at odds, and when the younger Murdoch returned to Australia after his father's death in 1952, he expected to inherit substantial wealth. Instead he received little beyond control of a single newspaper, the Adelaide News. The 22-year-old Murdoch brought a feisty attitude to the paper, and as circulation increased he began acquiring smaller newspapers from outlying areas. Within a few years Murdoch had purchased Sydney's Daily Mail, and in 1964 he launched Australia's first national paper, The Australian. By the mid-1970s Murdoch papers were a dominant force in Australia, and he began using his editorials to push conservative political issues. Murdoch bought the New York Post in 1976, making that paper famous for its salacious coverage of crime. Murdoch decided to move into television, but US law mandated that only Americans could own US television stations; thus he was naturalized in 1985, purchasing John Kluge's Metromedia the following year using it to launch America's fourth television network, Fox Broadcasting. In 1996 he started the Fox News Channel, delivering a staunchly conservative perspective on the news, as overseen by former Republican campaign wizard Roger Ailes. Murdoch's British papers solidly backed Margaret Thatcher, John Major, and Tony Blair, and his American mouthpieces have vocally backed Republicans since Ronald Reagan. During the 2002 and 2003 build-up to the invasion of Iraq, all of Murdoch's 175 newspapers editorialized for war. His companies' labor relations have sometimes been brutal, especially in England, where he led the industry in modernizing the printing process, laying off thousands of workers in the process. In 1999, The Economist reported that despite billions in profits, News Corporation had paid no corporate taxes for more than a decade, thanks to its complex international structure and extensive use of offshore tax havens. In 2004, Murdoch purchased a penthouse condominium in New York City for $44M. His net worth is estimated at about $7B. His second wife, Anna Torv, worked for Murdoch as a reporter before marrying him, and divorced him after more than thirty years when she discovered he had been having an affair with a junior executive at Star TV, a News Corp subsidiary. Torv reportedly won the largest divorce award in history, about $1.7B in assets and $110M in cash. Murdoch and his mistress, Wendi Deng, were married seventeen days after his divorce from Torv was finalized. Don Henley has said that his pop hit "Dirty Laundry" is based on Murdoch's style of journalism. Murdoch was reportedly the inspiration for Elliot Carver, the multimedia megalomaniac played by Jonathan Pryce who tried to start World War III in the James Bond film Tomorrow Never Dies. Asked if there is any truth to recent press describing his newfound piety, Murdoch replies: "No. They say I'm a born again Christian and a Catholic convert and so on. I'm certainly a practicing Christian, I go to church quite a bit but not every Sunday and I tend to go to Catholic church -- because my wife is Catholic, I have not formally converted. And I get increasingly disenchanted with the C of E or Episcopalians as they call themselves here. But no, I'm not intensely religious as I'm sometimes described." Interviewed in 1992. Nicholas Coleridge, Paper Tigers (1993), p. 487.